After receiving his doctorate from Harvard in 1939, Aiken collaborated for five years with a group of IBM engineers on the machine he envisioned at Harvard. It was called the IBM Automatic Sequence Controlled Calculator (ASCC), later referred to as the Mark I. It was one of the first full­scale digital computers that could be controlled by programmed instructions input into the machine. (Konrad Zuse completed a model of the first programmable computer called Z­1 in 1938 in Germany, about the time Aiken was beginning work on the Mark I.) The Mark I had registers for storing 70 23­digit, signed numbers, 60 constants, and could add, subtract, multiply, and divide as well as calculate logarithms, exponentials, sines, and cosines. The programmed instructions were fed to the machine through a hole­punched paper tape. The size of Mark I was astounding by today’s standards: it was 50 feet in length and weighed around five tons. It would have been considered fast if ENIAC, a computer built at the University of Pennsylvania, had not been released a year later. ENIAC was completely electronic and 500 times faster than the electromechanical Mark I, even though the Mark I was more precise. Following construction of the Mark I, Aiken founded the Harvard Computation Laboratory. There he built three other versions for the Navy and Air Force, including the Mark III in 1950, which was his first electronic machine. Both the Air Force and Navy honored Aiken for his distinguished service. Under Aiken, Harvard became the home for some of the first academic courses in circuit design and the design of components for electronic digital computers. In 1961 Aiken retired from Harvard. Even in retirement he continued to work. He helped the University of Miami create a computer science department, and he founded Aiken Industries. He died on March 14, 1973, in St. Louis, Missouri. Aiken’s Mark I moved computer design in the United States a huge step forward during a period when each new design added a world of further computer engineering possibilities. The early history of computer design illustrates a common maxim that, when working in a new field, initial efforts and innovations build upon trial and error. Aiken’s machines were not theoretical models but working machines. He turned possibilities into reality that others would appreciate and adapt. As the first fully operational computer governed by a set of programmed instructions in the United States, Aiken’s Mark I set the stage for other innovations in postwar Allied countries (those opposing Germany and its allies in World War II). Indeed, the University of Pennsylvania’s ENIAC, finished just one year after Mark I, used architecture similar to the Mark I. In May of 1949 Maurice Wilkes at Cambridge University finished the Electronic Delay Storage Automatic Computer (EDSAC). Delivering on the promise of a 1948 prototype built by Max Newman and Freddie C. Williams, it was the first fully operational computer controlled by an internally stored program. Aiken nurtured the computer engineers with whom he worked; these engineers would make their own independent contributions to the field. In 1952 GRACE MURRAY HOPPER, part of Aiken’s Mark I team, was the first person to develop and implement a compiler, a program that translates a high­level programming language into a code understood at the machine level. 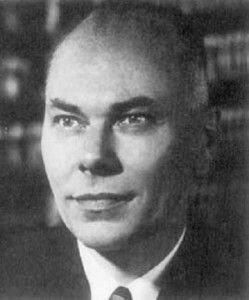 Aiken also helped to establish computer science as an academic discipline, benefiting not only his students at Harvard, but computer scientists at other universities as well. Posted on March 4, 2015 by Natalie. This entry was posted in Scientists and tagged computer science. Bookmark the permalink.